One of the best ways we can partner with you in your oral healthcare is to help you understand your examination, diagnosis, and treatment. 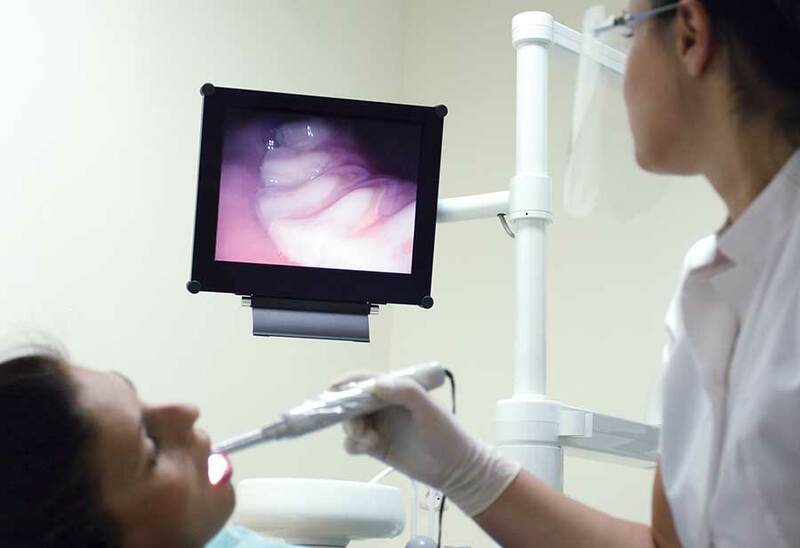 A valuable tool we use to accomplish our patient-education goals is the intra-oral camera. This small, handheld video camera is about the same size as a dental mirror (or an oversized pen) and comes with a disposable plastic sheath for contamination prevention. We use it to take actual pictures of your teeth with up to 25 times magnification and project them onto a screen to review with you. We can also use it to give you a video tour of your entire mouth so that you can see things such as plaque deposits, decay, worn teeth, and broken or missing fillings. Lastly, we will print pertinent images for your patient file for future reference and can even print images for you to take home. A picture is worth a thousand words. It's an adage we prove true many times each day in our office with our intra-oral camera. Prior to the development of this technology, some of our patients found it challenging to understand concerns such as dental decay and periodontal disease. Now, we are able to display, pause, and zoom in during our video examination of the problem area so that you can see it for yourself — all in color and crystal clear. An intra-oral camera enables us to make you more of an active partner in your dental treatment so that you can see what we see — an especially important benefit when we need to discuss additional treatments or to explain treatment options so that you can make informed decisions. Based on the above, we have found that our patients are more comfortable asking questions and are better able to understand a treatment option or oral hygiene concern. We can also refer back to these images with you to show you changes in your oral health and hygiene or how a multi-phase treatment is progressing. We would be happy to demonstrate the advantages of our intra-oral camera at your next visit to the dental office.